In 1845 the renowned architect Thomas Ellis Owen completed a map of Portsmouth which showed every plot of land in the Parish of Portsea and the buildings or groups of buildings on them, a map that allows us an extraordinary insight into the topography of Portsmouth at the time. Although Owen did not name every road in the Borough, one that he did so name was Wish Road, which we in the 21C would most certainly recognise as Albert Road, Southsea. Suprisingly, this is possibly the only instance in which Albert Road was referred to as Wish Road. The word 'Wish' is derived from 'Wisce', the Old English word for 'meadow', which would have been quite an appropriate description for the Albert Road area of the early 1840s as most of the land on either side of the road was given over to arable farming and pastureland. It was not however the only streetname in Southsea that used the word. Far better known was Wish Lane, later Wish street, which became King's Road around 1872 but to confuse matters there are known instances where persons living on Elm Grove gave their address as Wish Lane in 1841 as did others who are known to have lived on the Wish Road of Thomas Ellis Owen's map. The Portsmouth Encyclopedia certainly mentions Wish Lane together with Wish Place and Wish Villa, both of which are described as being on the north side of Albert Road but it doesn't mention Wish Road. 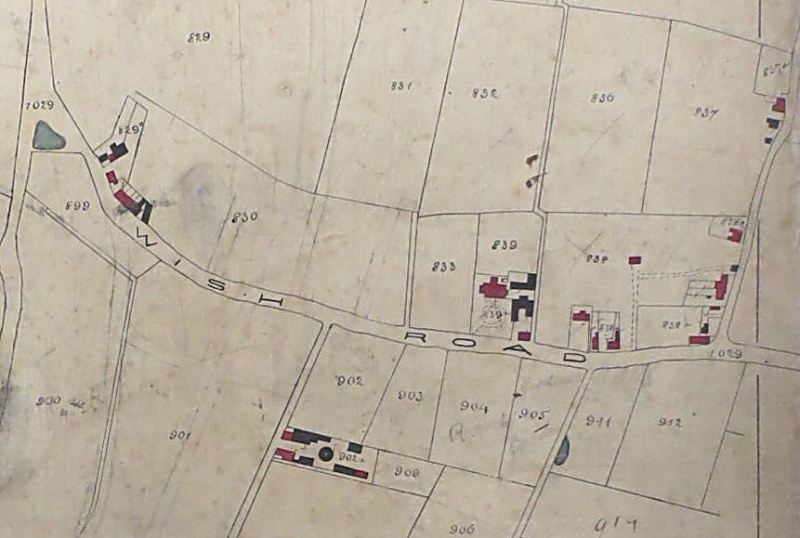 The Tithe Map can be used in association with both the Burgesses/Electors Lists and the 1841 Census to create a detailed picture of Wish Road/Lane in the 1840s. The map is particularly useful in that it distinguished between buildings used as dwellings and those associated with employment, red for the former and black the latter, as shown on the extract below. From the map we know that on the western segment of Wish Road there was a small group of buildings on the north side near the western end, a scattered grouping of houses on the north side further east, with a third group just south of Wish Road. To add detail to the layout we need the help of the 1841 census and particularly of the enumerator who was assigned the task of collecting names and addresses on Wish Road on the 6th June 1841. In common with most persons appointed as enumerators, the one we are interested in would have planned his route carefully to minimise the amount of ground he had to cover. It would have been a long enough day as it was without having to walk further than necessary. We could think of this as the Enumerator's Golden Rule and it applies from the very start of his day as it seems probable that he arrived on Wish Road from the west, where most of the population lived, and so would have begun his survey at the point where Albert Road and Victoria Road South now meet, but this will become apparent in any case. The first set of entries in the relevant census schedule refers to households in Wish Place which we need to identify on the map as this will confirm the starting point for the enumerator's journey. We note that there is still, in the 21C, a cul-de-sac called Wish Place on the north side of Albert Road, next to the Royal Albert Public House but this is unlikely to be the location of our first set of dwellings partly because the Tithe Map shows no row of dwellings at that point but more importantly because it would have been impossible for the enumerator to have started from that point without breaking the Golden Rule and having to retrace his steps to reach his next destination. In fact we know that Wish Place was the name given to the first group of buildings that the enumerator encountered as they are named as such on several later maps. Further evidence comes in noting that the group appears to contain 6 dwellings, the same number as listed on the census. They sit on a site now occupied by the King's Hotel and several shops to the west. Our enumerator recorded that at No.1 there lived John Hunt, an agricultural labourer with his wife Elizabeth and three children, plus Edmund Egerton, a blacksmith with his wife Elizabeth and their two young children. At No. 2 there was another Egerton family, probably Edmund's father William, a wheelwright, his wife Elizabeth and daughter Mary. It is worth noting that William Egerton appears on the Electors List for 1841 where he is described as living on Wish Lane. Next door at No. 3 was another agricultural labourer Thomas Gardener, his wife Sophia and three children who were sharing the accommodation with a policeman, William Moore and his wife Harriett. At No. 4 was Mary Walters, a laundress, with three children plus a 60 year old widow, Elizabeth Biggs and the wife of a seaman, Elizabeth Brunson with her twin daughters. A third agricultural labourer lived at No. 5, he was James Clements whose wife was Harriett and they shared the property with Elizabeth Smith, the wife of a seaman. The last property in Wish Place was No. 6 and it was occupied by Martha Hunt who was listed as a gardener, and her 6 children. It is not surprising that there should be three agricultural labourers in Wish Place given the amount of arable land in the vicinity. Moving eastwards from Wish Place the enumerator left Wish Road at what is now Napier Road as the dwellings around Dock Mill were included on his schedule. The exact location of the mill is well known today (see the article on Dock Mill and Dock Mill Brewery) as a number of dwellings still exist as Dock Mill Cottages. The first entry is curiously referred to simply as 'Brick Kiln' followed immediately by 'No. 1 Mill Lane'. The former is assigned to one Seaford, a labourer, and the latter to John Seaford, brick burner, and his wife Sophia. The occupants at No. 2 are Mark Marshall, a labourer, his wife Mary and two children whilst No. 3, also called Dock Mill was the home of William Webb, clerk, his wife Martha and two children plus Anna White, wife of a seaman and her daughter. The census record goes on to list seven more dwellings in this group which would suggest they were exceedingly small as the Tithe Map allocates very little space for so many houses. There is no doubt however that they are associated with the mill itself as Nos. 4 to 8 were all occupied by bakers or millers - William Batchelor, a baker, his wife Charlotte and two children at No. 4, Thomas Heathcote, a baker, his wife Hannah and their two children at No. 5, Alfred Sharpe, a baker, with his wife Ann and one child at No. 6, James Rogers, a miller, with his wife Martha at No. 7, George Fisher, a miller, with his wife Catherine and four children at No. 8. After that we cannot be certain that the trades represented were a part of the Dock Mill operations but it seems likely. At No. 9 was William Dawson, a butcher, with his wife Maria and two children plus John Ralfs, a clerk, his wife Sarah and three children whilst at No. 10 there is George Bendle, a blacksmith, with his wife Jane and four children. After that our enumerator returned to Wish Road and called at Wish House. As was noted earlier, this area of Southsea was almost exclusively farmland, indeed it was an ideal site for a wealthy man from Portsmouth to relocate, and Wish House was certainly large enough to qualify. 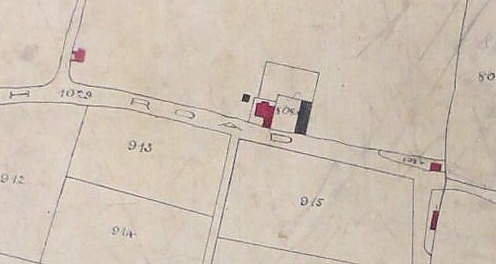 The exact location of the building has been disputed from time to time but the Tithe Map seems to clarify the issue in placing it on the western side of the corner between what is now Lawrence Road and Albert Road where a large house and lawn are shown and behind them is an area referred to in the Schedule to the Tithe Map as 'Pleasure Gardens'. The house and gardens were owned and occupied by Herbert Allen with his wife Mary and two young women, Jane Holmes (20) and Maria Bridger (15) who were probably servants. It is worth looking further at Herbert Allen as he had a not inconsiderable effect on life in Portsmouth in the 19C and left a notable legacy we can still see today. He was born c1770 and though little is known of his early life it is known that he made his fortune as a hatter on High Street, Portsmouth. Herbert met and married Mary, the daughter of Lake Taswell, a notable surgeon, scholar and gentleman on 13th August 1897. Taswell is remembered as the man who compiled the first ever published history of Portsmouth, but he did not approve of the match, considering Allen to be a mere tradesman, and allegedly banished his daughter from his household. Herbert and Mary Allen had just one child whom they named Lake, after his grandfather, and who, like his grandfather produced his own authoritative History of Portsmouth, based on and expanding the earlier work. He also collaborated with Frederick Madden on a number of historical studies. He was however always frail and prone to illness and died in his early 20s, presumably leaving his mother with no contact at all with her own father. Herbert Allen owned a great deal of land around Albert/Wish Road, including the whole area on the south side of Wish Road between Napier Road and Waverly Road which encompassed the Dock Mill thereby suggesting that he sold the land for the mill to the Dock Mill Society. Similarly he owned land to the west of Fawcett Road, part of which he probably sold to the Trustees of the Jews Burial Ground. Then there was the land either side of Waverley Road, on part of which were built Allens Road and Herbert Road, named appropriately after himself. After Wish House the next 14 entries on the enumerator's Schedule were described as Wish Village. Plainly we are not looking at a formal 'village' here, at least not in the sense of a group of houses congregated around a green or pond, rather it seems to be a form of shorthand for 'all the other dwellings on Wish Road' as they are quite a scattered bunch. The first is fairly easy to place as it was probably part of the Wish House estate in that it was situated at the very corner of modern day Lawrence and Albert Road and was inhabited by Thomas Marshall, who is listed as a gardener (presumably to Herbert Allen), with his wife Maria and five children. The remaining 13 households are more difficult to place. We know that a second enumerator began his days work at the junction of Wish Road and Jews Lane, also known as Jews Burial Ground Lane and latterly Fawcett Road, then headed north towards Lazy Lane and Fratton Bridge. This would rule out any of the properties on that road being included in Wish Village, leaving only 6 or 7 buildings in which to accommodate the families of William Bridger, agricultural labourer; Robert Hunt*, gardener; Elizabeth Hall, wife of a Naval Officer; William Smith and John Mack, both agricultural labourers, John Bower, wheelwright, Richard Ward, agricultural labourer, James Braden, labourer, Thomas Foot*, gardener, James Richards, sawyer, Charles Emery*, gardener, Thomas Foot* and John Jones, both agricultural labourers. Those marked with an asterisk are the only ones in this group to appear in the List of Burgesses in which all are listed as living on Wish Lane. Perhaps the most interesting member of this group is Charles Emery who although he gave his profession as 'gardener', he probably should be thought of more as a Market Gardener as the Tithe Map Schedule shows him to be living in the large building (known as Beach Farm) in the centre of the map below whilst farming the 11 acre field that surrounds it to the north. Presumably the two Agricultural Labourers, Thomas Foot and John Jones are both working for Emery and being housed in the same set of buildings. It is conceivable that the two remaining houses at the junction between Wish Road and the latter day Festing Road could have formed part of Wish Village, but if they did it would be impossible to accommodate the next two entries without breaking the Golden Rule. Those entries both refer to dwellings on Lump Lane, after which the enumerator headed over towards Milton, followed by Eastney and ending at Lumps Farm area. To complete this circuit without re-tracing his steps those buildings must be on Lump(s) Lane.